For our superhero unit students work with adjectives, descriptions and the present tense to describe physical attributes, personalities, and clothing. This was used as a MYP phase 5 (grade 9) and phase 6 (grade 10) criterion D writing assessment. The assessment was created using G.R.A.S.P.S. They were asked to create a new superhero for Marvel Comics' up and coming comic. There is no rubric with this assignment because I used MYP rubrics, however, this assessment could easily be used in a regular core French classroom or adapted into a project! 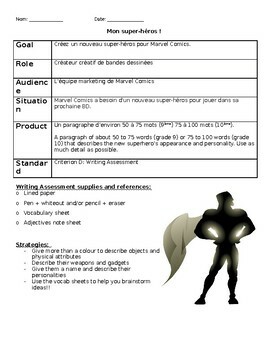 The document can be edited to suit your class and goals.